The VMP-AM-V3-F150-2009 from Larson Electronics is a Permanent Antenna Mounting Plate that allows operators to install up to four antennas on their 2009-2014 Ford F150 steel body trucks without drilling any holes. This antenna mounting plate is ideal for law enforcement, DOT workers and anyone else who needs to easily mount an antenna but doesn't want to drill holes in their truck. This lightweight mounting plate allows operators to mount antennas on their trucks without drilling into the body of the truck itself. 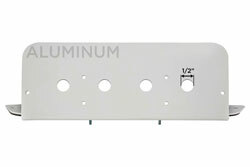 This mounting plate can support antenna arrays of up to 20 lbs. The VMP-AM-V3-F150-2009 features four predrilled 3/4" holes for antenna mounting and is compatible with 2009-2014 Ford F-150 steel body pickup trucks. Installation of Lights/Equipment: The VMP-AM-V3-F150-2009 comes predrilled with four 3/4" holes that allow for the secure mounting of various antennas. Depending on the number of holes required for mounting various types of antennas, this mounting plate can hold up to four antennas. 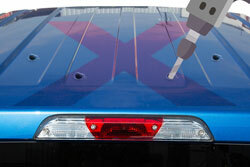 Then the entire assembly can be mounted to the truck via the third brake light as explained below. 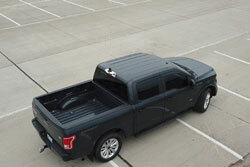 Truck Installation: The VMP-AM-V3-F150-2009 is easy to install and requires absolutely NO drilling to mount to the truck. This mounting plate installs via the 3rd brake light on 2009-2014 model year Ford F150 pickup trucks between the body of the truck cab and the light. Operators simply remove their 3rd brake light, position the mounting plate bracket and reinstall the light through the bracket. 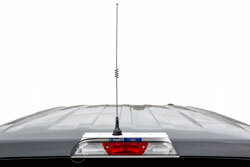 Applications: Hunting, fishing, off-roading, property management, security, search and rescue, farming operations, law enforcement, DOT and any other applications for which a roof mounted antenna is needed for 2009-2014 model year Ford F150 steel body truck owners.